Yeah, but: It's just dandy for what it sells for. Olympus has a habit of re-introducing two zoom lenses repeatedly. One lens is the 14-42mm 1:4-5.6 kit lens. 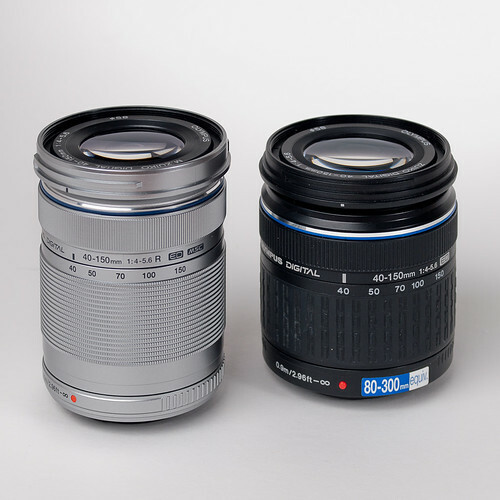 The other zoom lens that Olympus has released repeatedly is the 40-150mm zoom. It first appeared along with the 14-45mm when the Olympus E-300 was introduced. It was a rather large lens with an aperture range of f/3.5 to f/4.5. As large as it was I used mine on my E-300 quite a bit and with good effect. While it was an excellent performing lens for the price, the biggest complaint heard from all over the 'net was how big and heavy it was. When Olympus introduced the E-5x0 series of 4/3rd cameras, it cut the size of the Mark 1 down considerably and gave it a slower maximum aperture range of f/4.0-5.6, producing the Mark 2. The Mark 2 lens remained a staple of the Olympus stock lens kits for the remainder of the E-4x0/5x0/6x0 manufacturing run. I wouldn't call it popular, but it was certainly ubiquitous, so much so that Olympus sold a combination of the Olympus MMF-2 4/3rds to µ4/3rds and the Mark 2 lens for use with the E-P2. 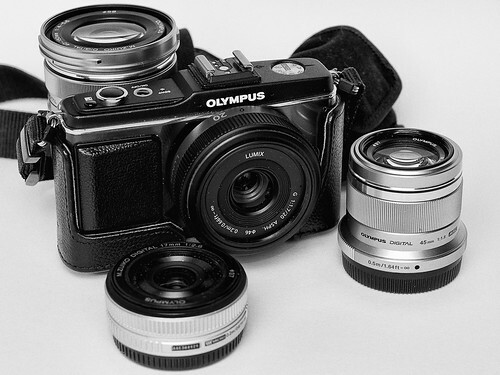 That's the combination I purchased, direct from Olympus, for a modest $199. I used the Mark 2 quite a bit, both with the E-P2 as well as with my E-3. It was slow to focus on the E-P2, but it was decent enough and helped me to grab good shots when I needed to with the E-P2. And for $200, I got an affordable and adaptable short telephoto zoom. But it wasn't a native µ4/3rds lens. I wanted a native version of the lens if for no other reason than to get a lens with better autofocus speed on the E-P2. So I waited a bit and sure enough Olympus released a Mark 3 version of the lens that was native µ4/3rds mount. It was engineered to focus quietly and given the MSC (Movie & Still Compatible) moniker. As a consequence the price moved up to $300. 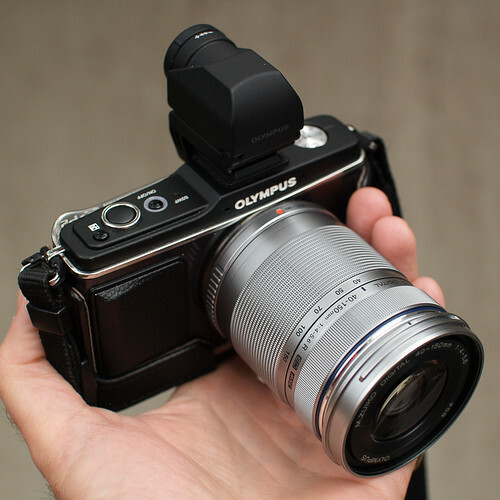 Olympus released it with a plastic bayonet mount (like they'd done with the Mark 2). I didn't feel inclined to spend $300 on a lens that didn't have a metal bayonet mount. The M.Zuiko 17mm, which sold for less, had one, and my M.Zuiko 14-42mm Mark 2 kit lens had one as well. Eventually Olympus released a Mark 4 version when they released the E-P3, this time with the 'R' designation. The 'R' differences from the Mark 3 were a faster focus motor and different lens coatings. And the price went up slightly yet again. This past December, when Adorama surprisingly offered the silver 'R' version for $160, the clamp around my credit card loosened and I purchased a copy for myself. Physically the 'R' version is slightly narrower in diameter, but slightly longer, than the Mark 2. It's also lighter. In the hand the 'R' version feels better built than the Mark 2 version, but I wouldn't categorize the Mark 2 version as poorly built. The bayonet is plastic (as it was with the Mark 2 and Mark 3 versions), but it mounts snugly and tightly on the E-P2. How long it will continue to do this I have no idea. The 'R' version, compared to the Mark 2 with adapter mounted on the E-P2, is blazing fast when it comes to autofocus speed on the E-P2. 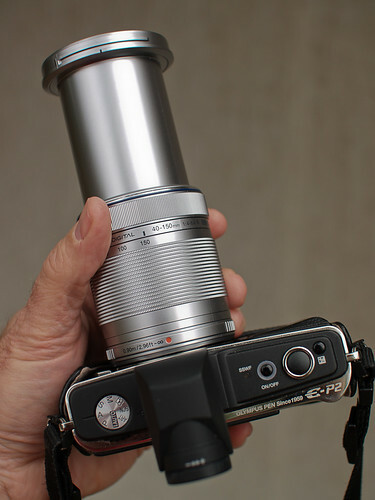 Because of its very light weight it balances quite well in the hand, even when zoomed out to 150mm. You'll note that I have the VF-2 mounted on the E-P2. 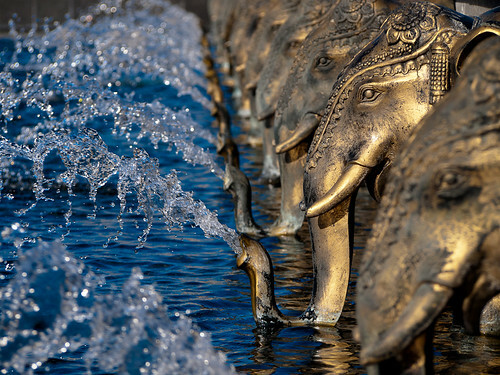 If you intend to use the 40-150mm at 100mm or longer, then you're going to want to use the EVF to help focus and compose. Using the LCD on the back at the longer focal lengths only makes sense if you have the E-P2 on a stable platform, such as a tripod. Otherwise you're going to see the image jump and dance all over the place. The EVF gives you a third point, your head, to help stabilize the whole assemblage (the other two points being your left and right hands). With my copy I noted that the zoom ring was tight, almost too tight. With its light weight you won't have zoom creep if the lens is pointing down. Focus is focus-by-wire, which isn't all that good or bad. I've yet to have to manually focus this lens, as the 40-150mm and E-P2 always seem to pick the point I want to focus on. I can't get over how silently this zoom focuses. It's fast and silent focusing performance is a spoiler. The only other lens that focuses this way is the M.Zuiko 45mm, which is also an MSC lens. In bright outdoor light it's a joy to use when it's needed. I've taken enough photos with the 'R' version to come to the conclusion that it's as good a performer, IQ wise, as every other version I've owned and used. In bright light and stopped down around a stop the lens will produce nice, clean, crisp, well-colored photos with plenty of detail. While the lens can produce good detail, it's not going to give you the same level of performance of a zoom that's five times its cost (or higher). 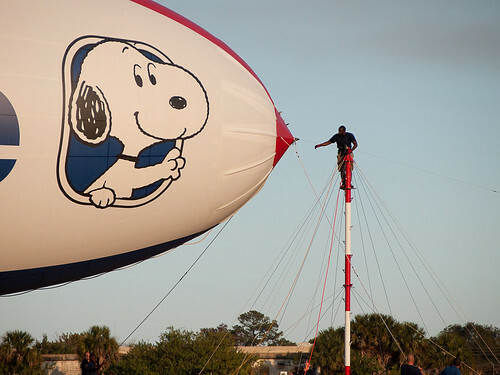 The image of the tender getting ready to latch the airship to its mooring tower shows the limit of its resolution. This photo was taken late afternoon. If you look closely you'll see the line that connects the tip of the airship, through the tip of the mooring tower, and then back off to the right. It doesn't look quite sharp enough, not enough separation from the background sky. It would have looked better with the 50-200mm but then again, if I had the 50-200mm mounted on the E-P2 it would have handled very awkwardly, and you can rest assured it wouldn't have focus locked nearly as quickly as the 'R' version on the E-P2. Remember that this is a $200 zoom lens, not the equivalent of the Zuiko Digital 50-200mm SWD (or any of the SHG zooms). But then, it's roughly 1/5 the cost of the 50-200mm and quite a bit smaller and lighter. This is the kind of lens you want in your kit to make your kit as small and light weight as possible. M.Zuiko 17mm. E-P2 in center with Panasonic 20mm. Look at my modest E-P2 kit, and you'll see my copy of the 40-150mm peeking out from behind the E-P2. It's a great little lens for the money, the kind you carry with you on impulse without having to worry about the consequence of it being too heavy or too expensive if something happens. In the right light it works quite well. It is, in my opinion, the best utility zoom for the money, especially if you can purchase it for $200 or less. Especially less. I use Olympus, and all different kinds of Olympus. 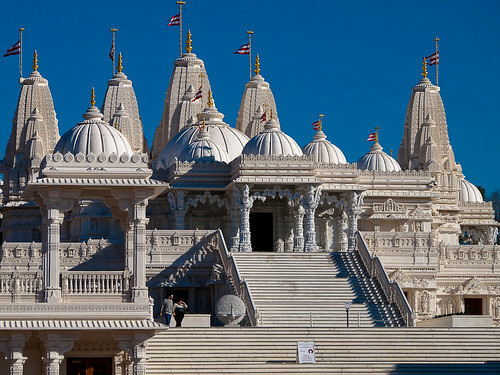 The two photos of the 40-150mm mounted on the E-P2 were taken with the E-1 and Sigma 30mm 1:1.4. The first image was a JPEG taken out of the E-1 and cropped in post 1:1. The photo of the two 40-150mm lenses as well as the kit photo were taken with the E-3, the ZD 50mm, and a pair of FL-50Rs, one in an Apollo 42" reflector and the other using a Rogue FlashBender. Do you have any issue with the tight zoom ring? I'd like to know if it's normal and whether it will loosen with use. Thanks for the review. First, the zoom ring is tight, tighter than all my other zooms. But I don't have problems with the zoom being too tight. As for loosening with use, it may have loosened with my use, but I could only say for certain by comparing it with a new out-of-the-box copy. Thanks for the review — very useful. The current R MSC version of the 14-42mm kit lens is also incredibly fast and silent to focus. (Technically, I think it's the fourth release of the 14-42mm.) I use it on a new E-PL3 that I got at a bargain price — my first Oly since using an OM-10 as a kid; the downside of starting Olympus CSC use with a lens like that a faster, brighter µ4/3 lens like Panasonic's 20mm f/1.7 is going to seem slow and disappointing when focusing, even though it's optically strong and is my natural and preferred focal length (and I seem to live in the twilight, and need those big apertures). Panasonic Lumix G 20mm F1.7 ASPH.